Are you due for a siesta? Of course you are! 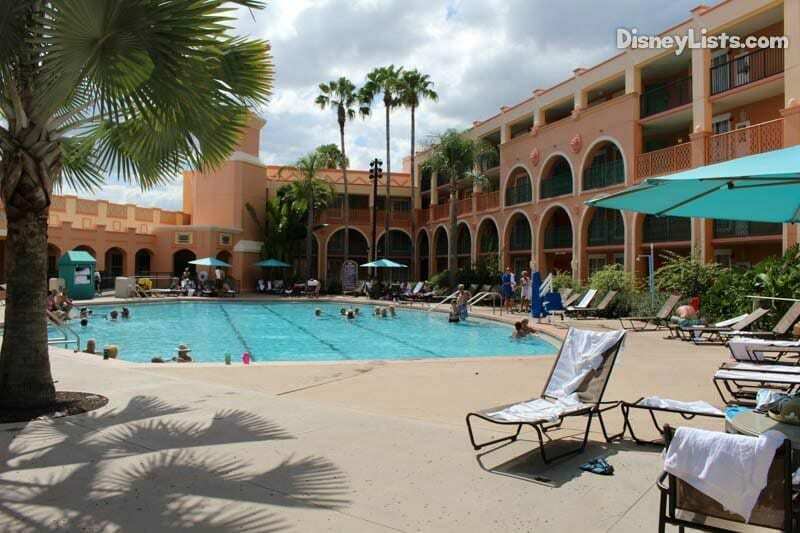 Treat yourself (and your family) and book a resort reservation at Disney World’s Coronado Springs Resort for that well deserved and much needed rest and relaxation. Need further persuasion? 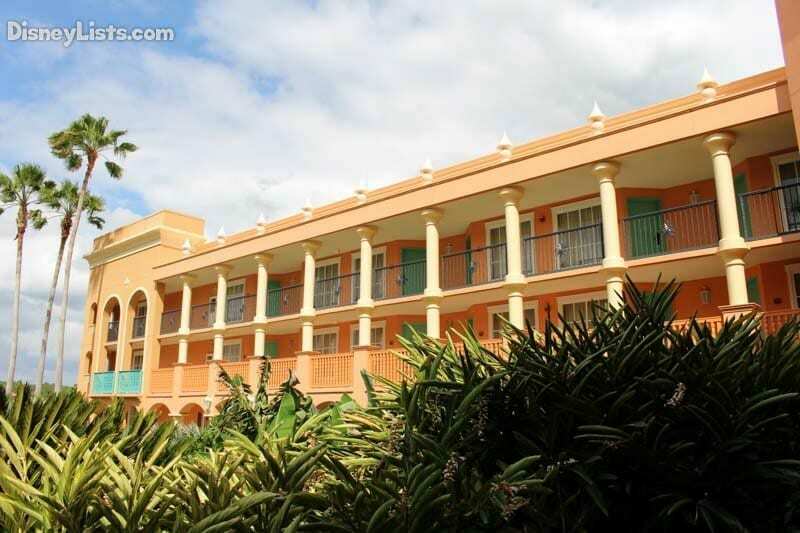 Check out these 8 reasons to stay at Coronado Springs! 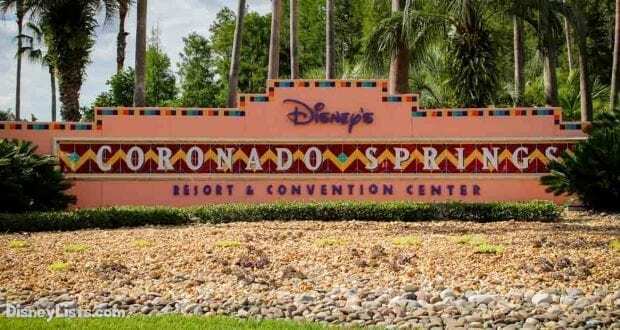 Editor’s Note: Coronado Springs is currently undergoing construction to add additional rooms and expand convention facilities. You can read about the expansion by clicking here. Once stepping foot on Coronado Springs property, be prepared to be transformed to a Spanish Colonial Mexico themed resort. 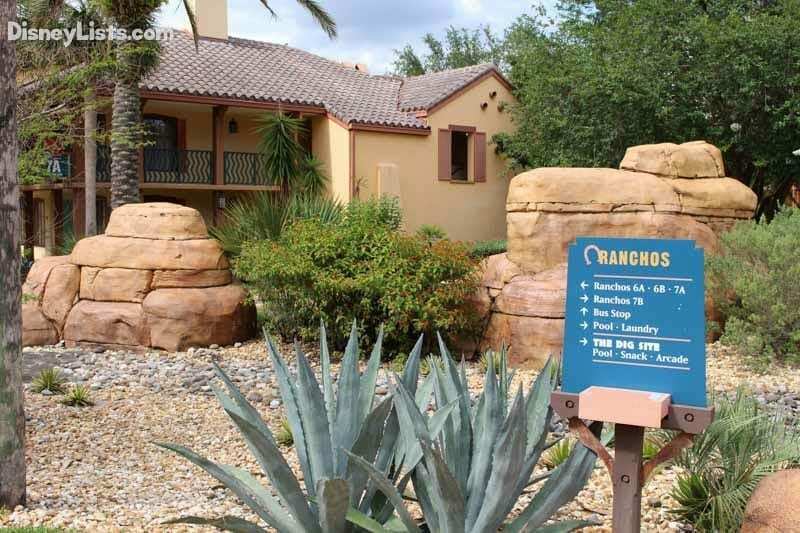 The vibrant colors and the southwestern inspired architecture provides a peaceful and inviting feel. We especially love the way the romantic side of the resort glimmers into the evening off of the large lake in the heart of the resort. From bending palm trees to hanging lights that light the paths to Spanish instrumental music, we found ourselves getting lost in the essence of the resort. While we expected the resort lobby area to match the exterior southwestern décor (which it did beautifully), we were thrilled with the resort room as well. With a chance to stay in the casitas, rustic ranchos, or beachfront cabanas – we didn’t have to worry about being disappointed in our location as all of these buildings and rooms are beautifully decorated inside and out. We especially loved the Hidden Mickey’s inside the Mayan themed patterns on the bed and wonderfully carved mirror frames and headboards. What drew us to it faster than just about anything else, were the hammocks that we swaying in the breeze on the white sand beach, under the beautiful palm trees. Snuggle up with your loved one or relax solo in one of these hammocks as the cool air from the lake gives the sense of having the beach just steps away. 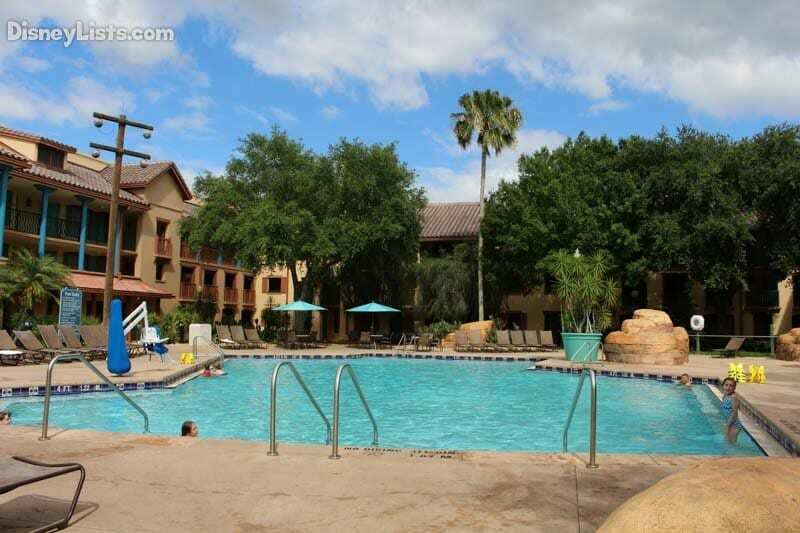 We feel as if we have adventured off to a tropical destination – not the outskirts of Orlando! 4 – Who Wants Tacos? Yes, please! Coronado Springs serves delicious Mexican food along with great American cuisine selections. We were thrilled at the dining variety as well as the menu items. Everyone in our family found it easy to select something to eat while dining at the quick service location, Pepper Market. The tacos were tremendous, the bacon burger was perfect, and the kid’s macaroni and cheese hit the spot for the kiddos! Don’t forget about the enticing Maya Grill restaurant. This is a majestic, Mexico themed restaurant that celebrates the Mayan motifs of fire, sun and water. Other dining options include Las Ventanas, Café Rix, and Siestas Cantina. Try the gelato and/or sorbet at Café Rix – they are yummy! What would a good siesta be without a refreshing drink in your hand? Laguna Bar is beautifully located next to the lake which makes for an excellent place to relax and enjoy a drink as the lights glimmer off the water. The Rix Lounge is elegant in design and has some wonderful appetizer style snacks that go perfectly with their full service bar selections. Siestas Cantina which we mentioned above also has some great drink selections pool side! 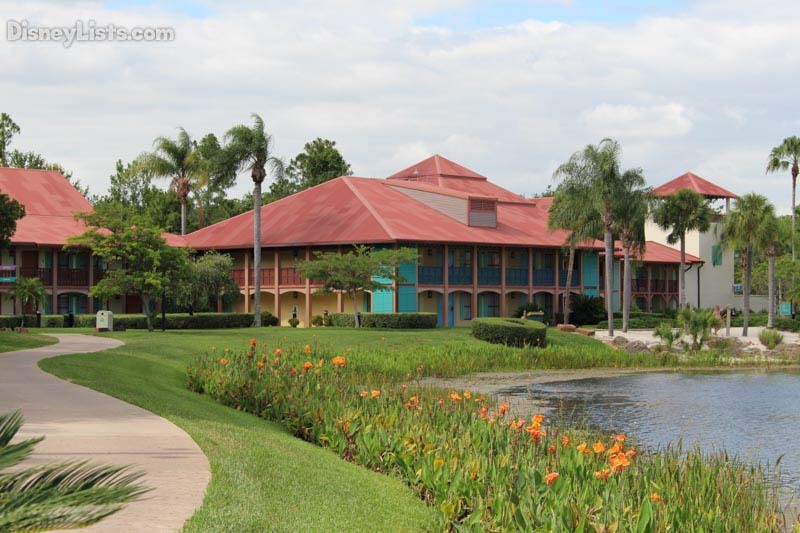 There is plenty of recreation available at Coronado Springs Resort. Our favorite is of course the pools! We especially loved The Lost City of Cibola Pool at the Dig Site, but there were also three other pools located throughout the resort. The Dig Site looks like Mayan ruins and the pool there has a 123-foot waterslide. Watch out however for the water spitting jaguar as you slide down! 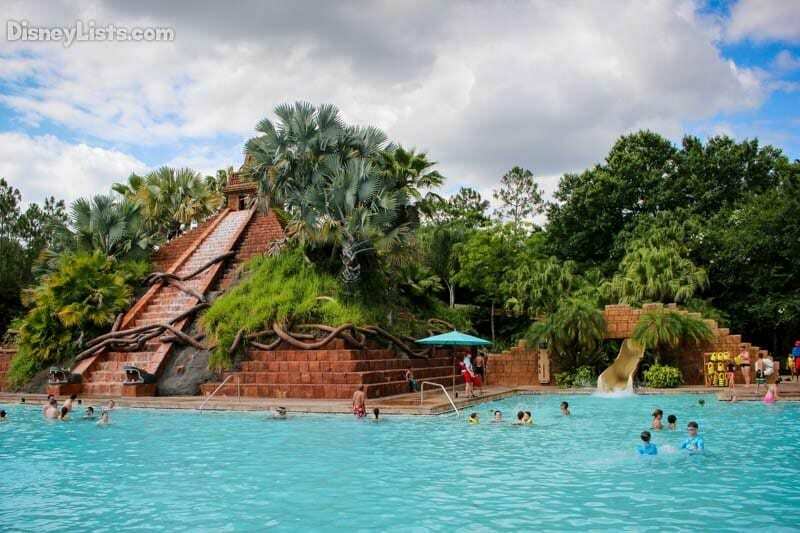 The largest hot tub at Disney is also located at the Dig Site! Plus, the kids can enjoy the playground as a break from the pool, or step into the awesome Iguana Arcade for some fun gaming. Beach volleyball, running/walking trails, campfires, and nightly Movies Under the Stars can really allow a family to spend the day at Coronado with plenty to do. 7 – Massages, and Facials, and Nails… Oh My! We’d be crazy if we didn’t mention one of the best reasons to stay at Coronado Springs is for the La Vida Health Club and Casa De Belleza Salon! Of course, you can lift weights and work out at La Vida Health Club, but let’s be honest – we were mostly excited about the spa portion! Massages (even in-room massages) and facials are available. Plus, right next door, stop by the Casa De Belleza Salon to get your hair, makeup, and/or nails done. Go ahead, spoil yourself! Easy access! Jump aboard Disney’s bus transportation or drive your car to reach the parks – either way, we were pleased with the convenience Coronado Spring’s location provided. 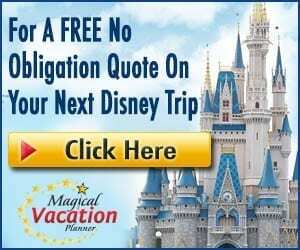 We especially enjoy the short trips to Epcot, Hollywood Studios, and Animal Kingdom. Plus, if you are looking for a day to cool off at Disney’s Blizzard Beach, you don’t have to go far. Saving time to get to some of our favorite places on Disney property makes for another great reason to stay at Coronado Springs. 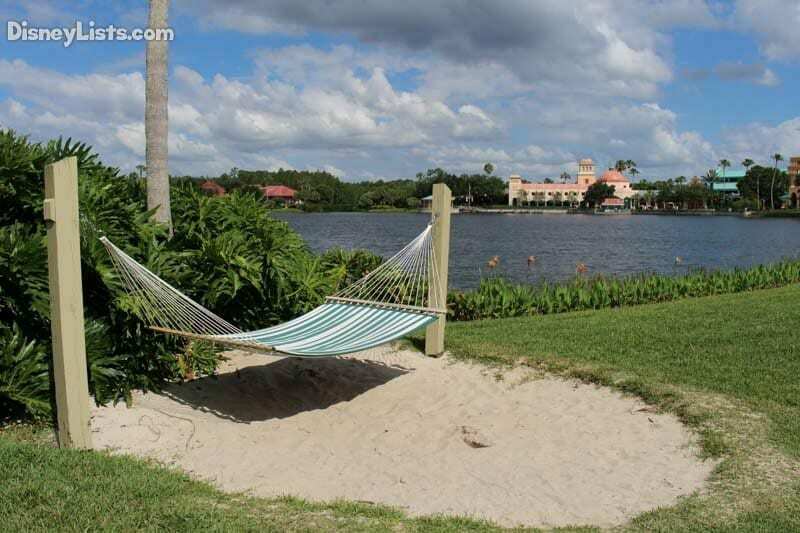 We hope you enjoy your siesta at Disney’s Coronado Springs Resort. We’re sure you’ll find yourself relaxing in a hammock with a drink in your hand soon enough after your arrival!